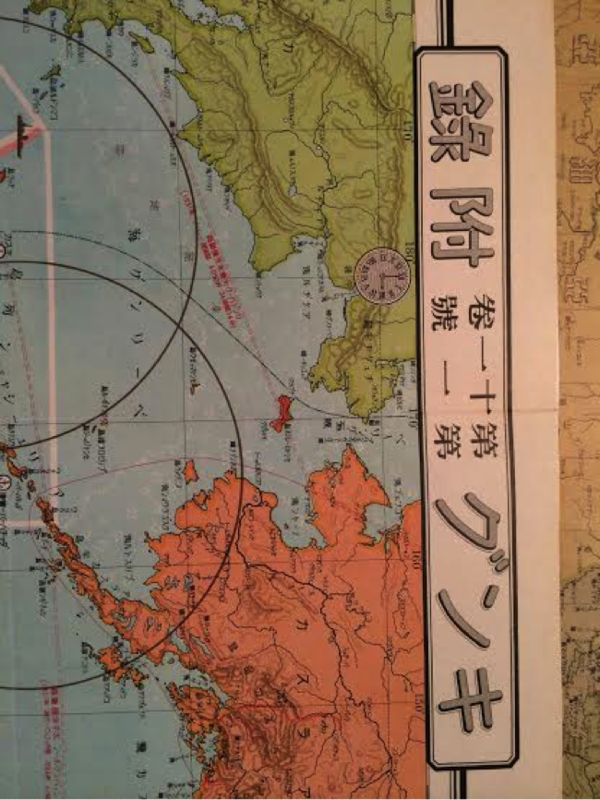 This map was printed December 3, 1934 (SHOWA 9) and published January 1, 1935 (Showa 10) by The "GREAT JAPAN DEBATE SOCIETY" a right wing organization before WWII. KING MAGAZINE supplement issue, 11th Volume. The insets show a 1st comparison of military might of the ARMY, AIR FORCE and fleet SIZE OF RUSSIA, AMERICA AND JAPAN. Map measures 31 x 43 inches. Japan was a member of the Allies during WWI and participated in a joint operation with British forces in the Battle of Tsingtao to capture the German settlement in China's Shandong Province. The Imperial Japanese Navy was tasked with pursuing and destroying the German East Asiatic Squadron and protection of the shipping lanes for Allied commerce in the Pacific and Indian Oceans. During the course of this operation, the Japanese Navy seized the German possessions in the Marianas, Carolines, Marshall Islands and Palau groups by October 1914. These islands became important staging grounds for Japanese air and naval offensives in the Pacific War. The mandated territories also produced significant quantities of sugar cane, bananas, pineapples, taro, coconuts, and other tropical farming products on a par with Taiwan. 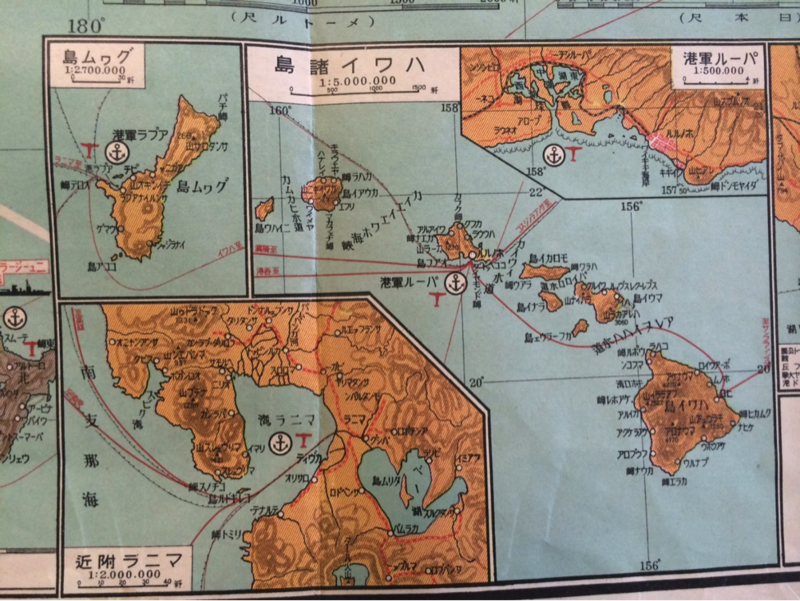 The islands also provided bases for the Japanese fishing fleet. Already controlling an area directly surrounding the South Manchuria Railroad, Japan's Kwantung Army further invaded Manchuria (Northeast China) in 1931, following the Mukden Incident, in which they claimed to have had territory attacked by the Chinese (a few meters of the South Manchuria Railway was damaged in an explosion caused by dynamite). When Japan withdrew from the League of Nations in 1933 over the Mukden Incident, it also renounced all treaty obligations. Japan's intention to acquire resource-producing colonies in the Pacific and Southeast Asia would likely lead to confrontation with the United States, thus the U.S. became Japan's primary potential enemy. War was eminent and now was the time to begin preparation. 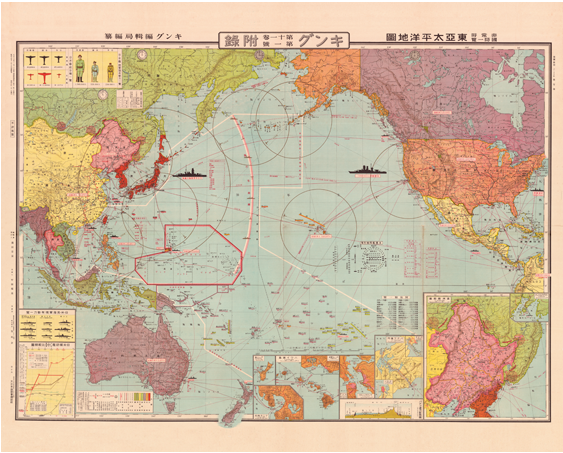 This map published in 1934, one year after leaving the United Nations, shows Japan sizing up the military might of it’s potential enemies. 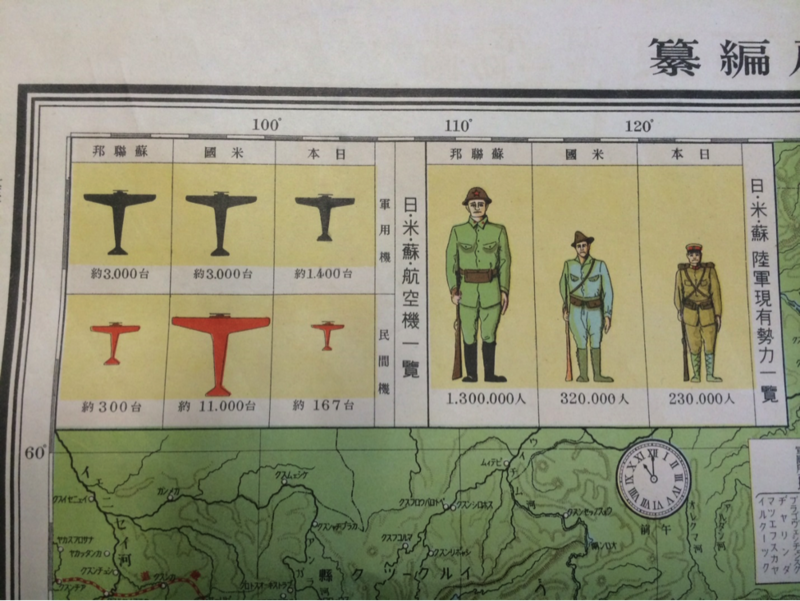 Insets show a comparison of the Air Force, Fleet Size, and Army of the USA, Russia and Japan. 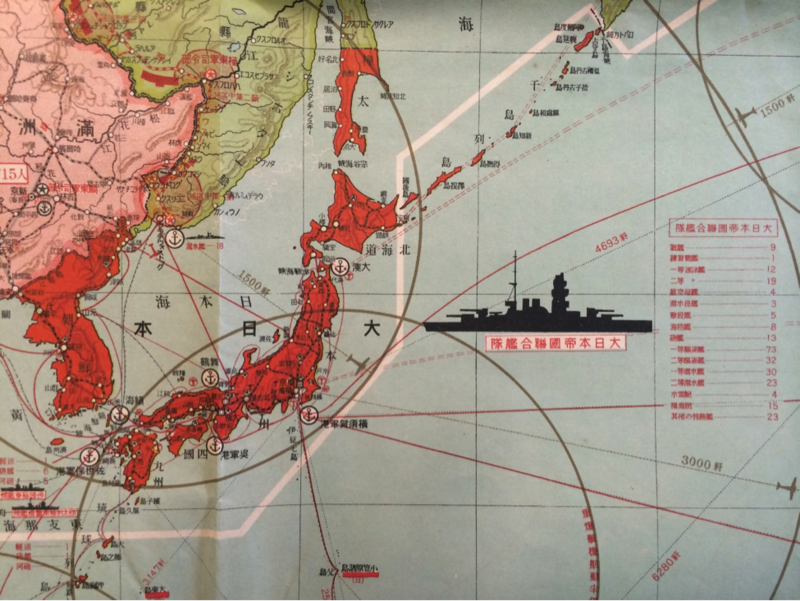 Strategic areas important to the Japanese are distinguished, including Midway, Pearl Harbor, Dutch Harbor in the Aluetians, Dutch East Indes and French Indo China. Eventually all of these areas would be struck by the Imperial Japanese Navy. 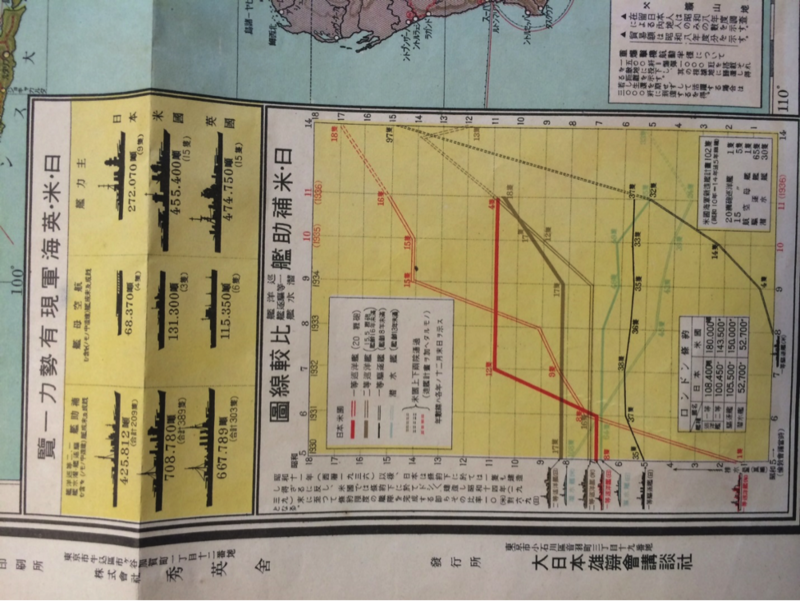 This is a great example of an early map used in preparation for war by the Imperial Japanese Navy. Based on the date of issue, large wall map size and the strategic list of targeted geographic areas, this map was probably used for military purposes and would not have been available for civillian use. A cornerstone for any Pacific map collection.